Landscape Arch is in the Devils Garden section of Arches National Park, and is one of the world's greatest natural wonders. This arch vies with Kolob Arch in Zion National Park for the title of world's longest natural sandstone arch. Most observers agree that of the two arches, Landscape is the more spectacular. It is hard to believe that a piece of rock like this can exist. 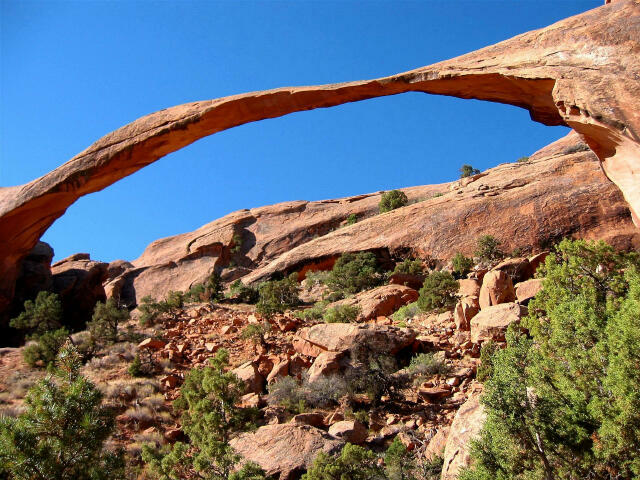 In its thinnest section the arch is only 11 feet thick, yet it supports a span of rock approximately 300 feet long. This arch could collapse at any time. On September 1, 1991, a 73-foot slab of rock fell out from underneath the thinnest section of the span, reducing the thickness of the span from 16 feet to 11 feet. On June 5, 1995, a 47-foot mass of rock fell from the front of the thinnest section of the arch, followed by another 30-foot rock fall on June 21, 1995. The short loop trail that went directly underneath the arch has been closed because of government liability should more rock fall.